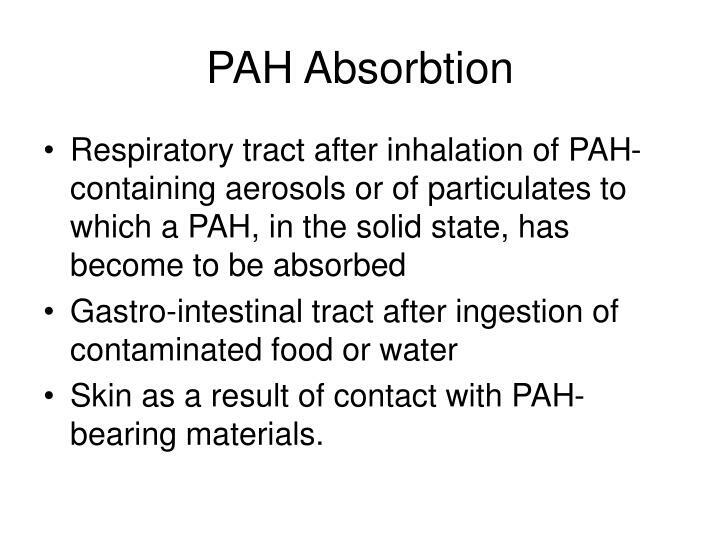 Skin as a result of contact with PAH-bearing materials. 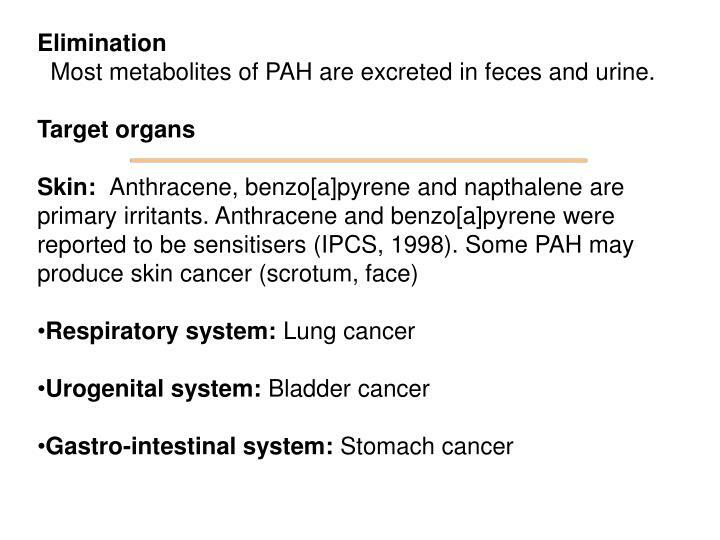 Most metabolites of PAH are excreted in feces and urine. 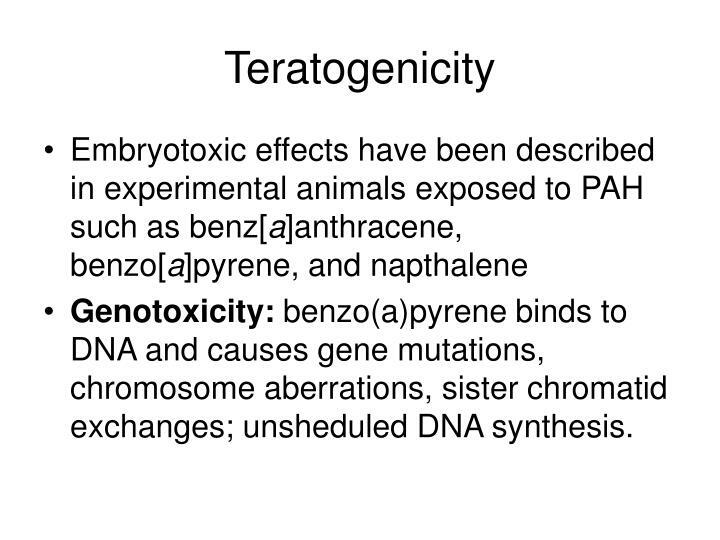 Genotoxicity: benzo(a)pyrene binds to DNA and causes gene mutations, chromosome aberrations, sister chromatid exchanges; unsheduled DNA synthesis. Cancers associated with exposure to PAHs-containing mixtures are predominantly lung and skin cancers,following inhalation and dermal exposure, respectively. 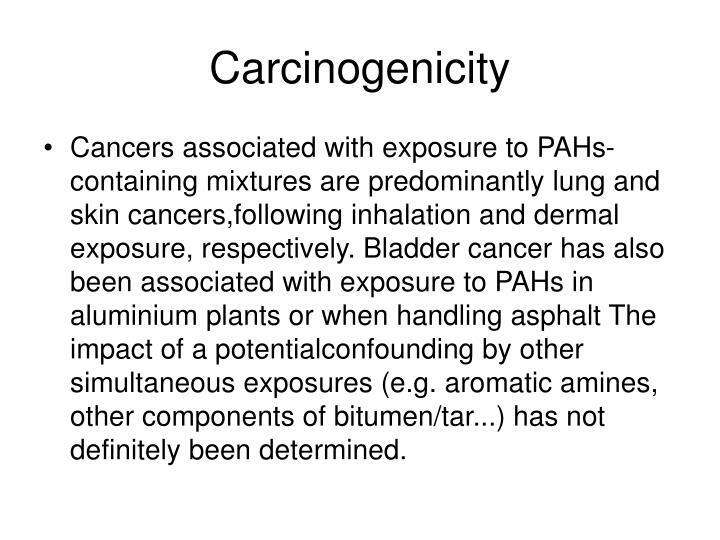 Bladder cancer has also been associated with exposure to PAHs in aluminium plants or when handling asphalt The impact of a potentialconfounding by other simultaneous exposures (e.g. 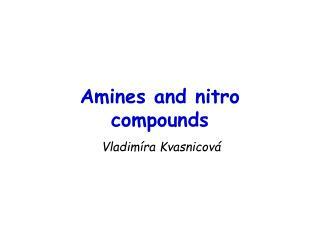 aromatic amines, other components of bitumen/tar...) has not definitely been determined. 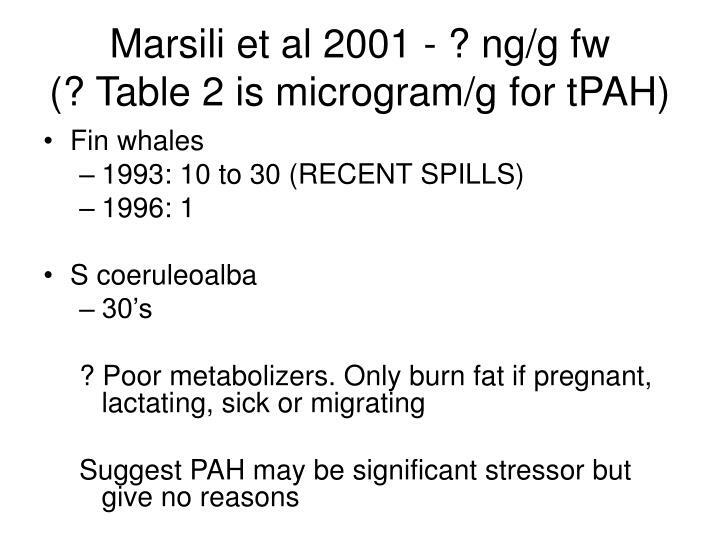 Are PAH more significant to mm than residue data would imply? 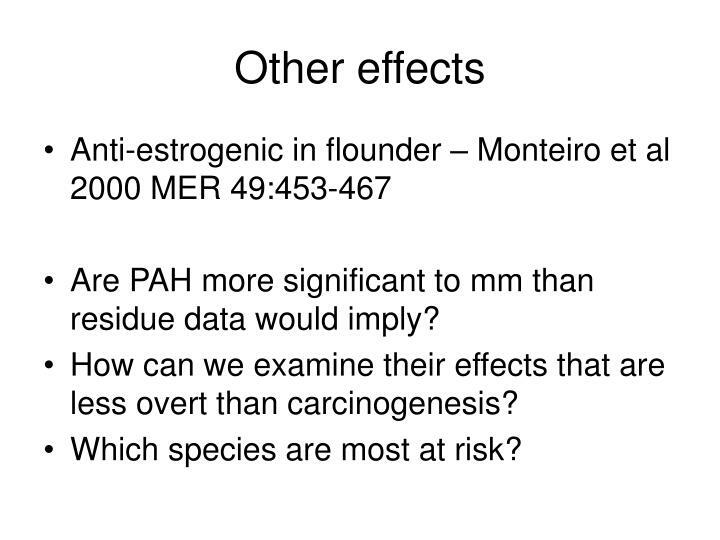 How can we examine their effects that are less overt than carcinogenesis? Which species are most at risk? ATSDR (1995), Toxicological profile for Polycyclic aromatic hydrocarbons (PAHs)Updata, U.S. Department of Health & Human Services, Agency for Toxic Substances and Disease Registry, U.S. Governement Printing Office Hellou, J., Stenson, G., Ni, I. H., and Payne, J. F. 1990. 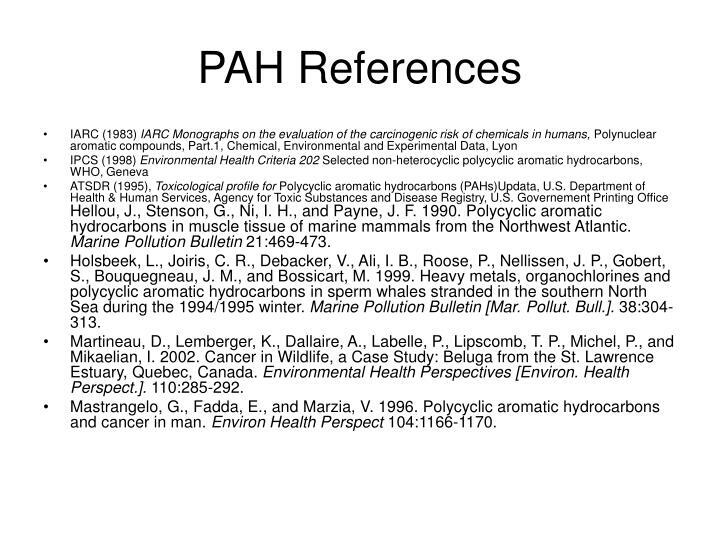 Polycyclic aromatic hydrocarbons in muscle tissue of marine mammals from the Northwest Atlantic. Marine Pollution Bulletin 21:469-473. Holsbeek, L., Joiris, C. R., Debacker, V., Ali, I. B., Roose, P., Nellissen, J. P., Gobert, S., Bouquegneau, J. M., and Bossicart, M. 1999. 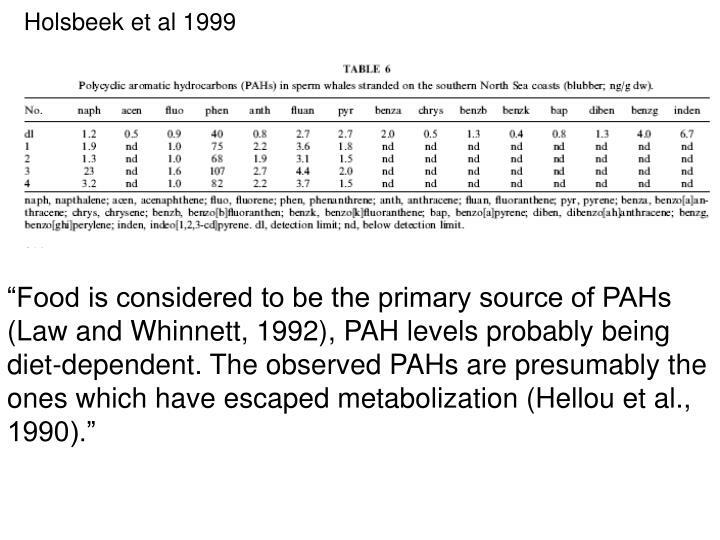 Heavy metals, organochlorines and polycyclic aromatic hydrocarbons in sperm whales stranded in the southern North Sea during the 1994/1995 winter. Marine Pollution Bulletin [Mar. Pollut. Bull.]. 38:304-313. 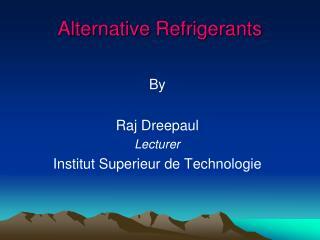 Martineau, D., Lemberger, K., Dallaire, A., Labelle, P., Lipscomb, T. P., Michel, P., and Mikaelian, I. 2002. 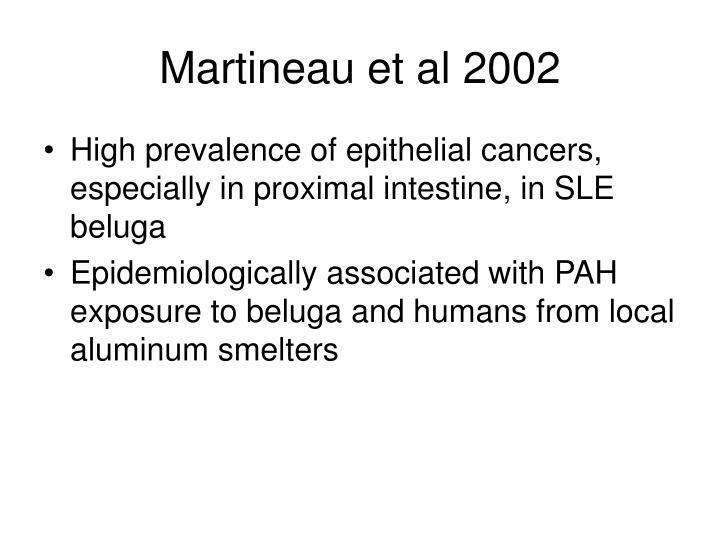 Cancer in Wildlife, a Case Study: Beluga from the St. Lawrence Estuary, Quebec, Canada. 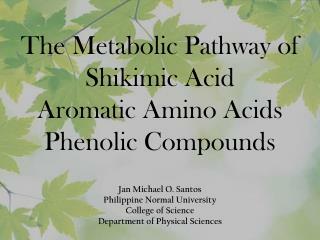 Environmental Health Perspectives [Environ. 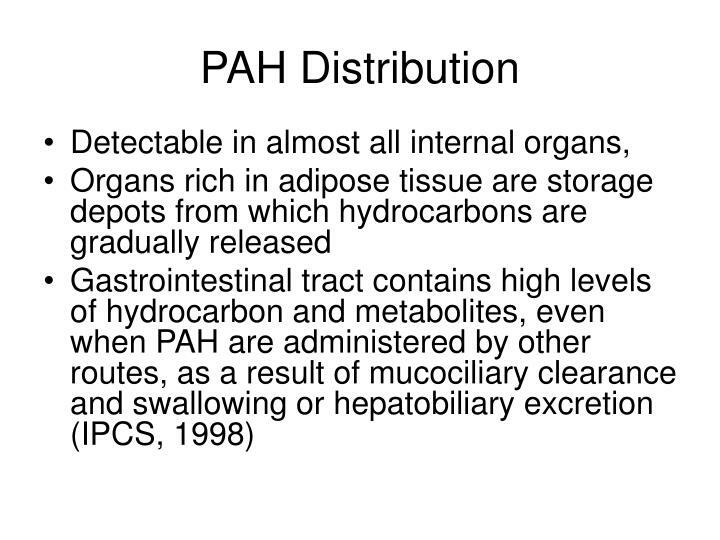 Health Perspect.]. 110:285-292. 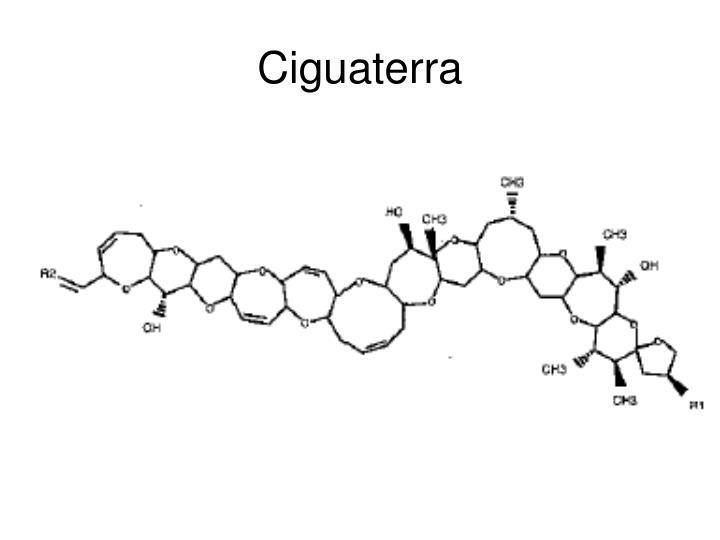 Mastrangelo, G., Fadda, E., and Marzia, V. 1996. 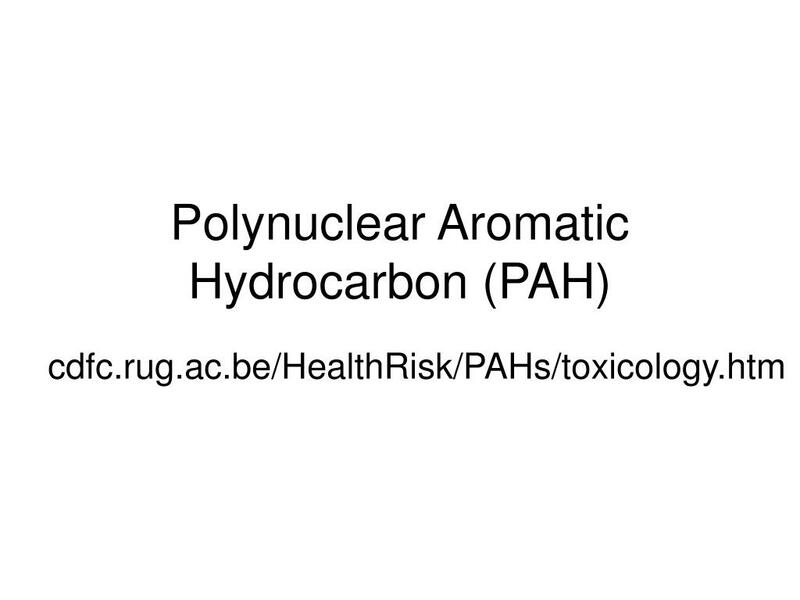 Polycyclic aromatic hydrocarbons and cancer in man. Environ Health Perspect 104:1166-1170. 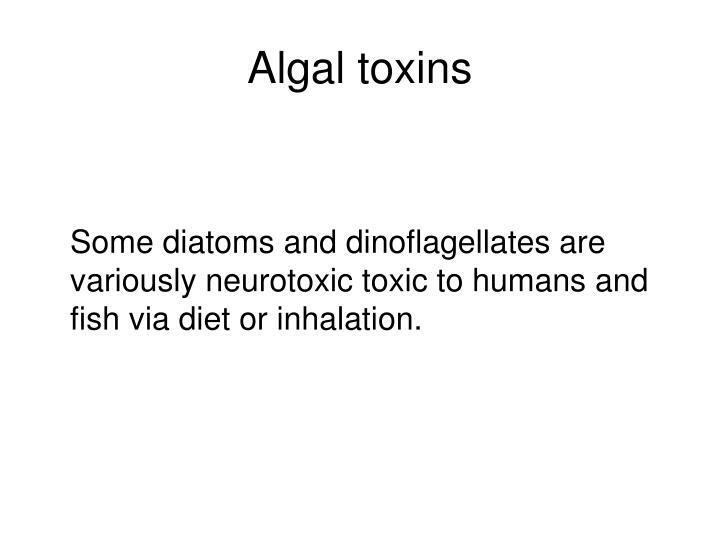 Some diatoms and dinoflagellates are variously neurotoxic toxic to humans and fish via diet or inhalation. 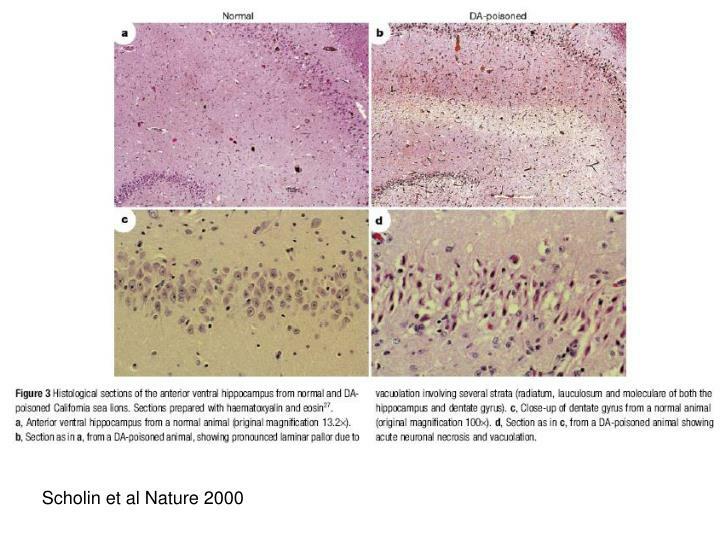 California Sea Lions 1998 – head weaving, scratching, tremors and convulsions – See Gulland et al 2000 and Scholin et al 2000. 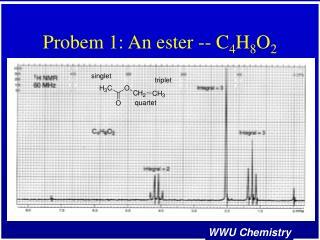 Microgram per gram levels of DA in serum, urine and feces (it is cleared rapidly in urine)– similar levels to LD50 in mice. 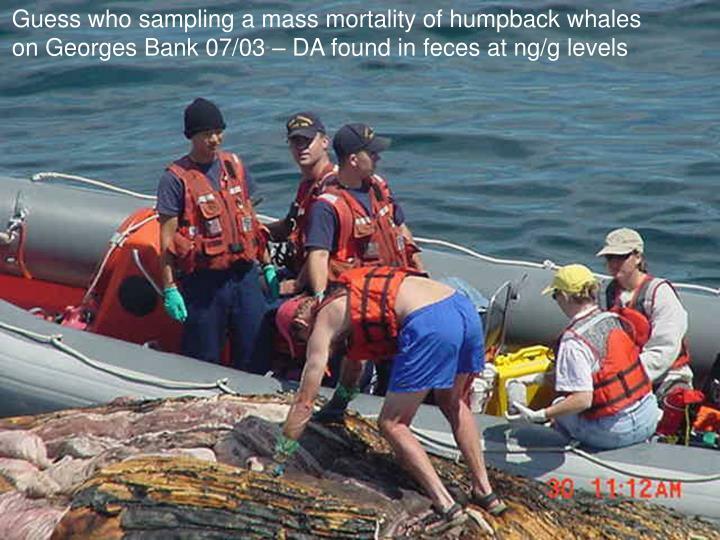 Detected in humpback mortality on Georges Bank summer 2003 at ng/g levels in feces. 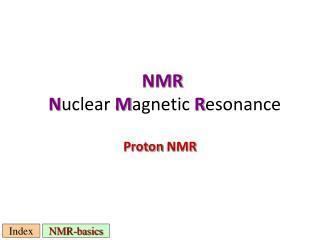 How do we get at the multi-factorial agents? How do you triage the analysis of a mass mortality event? 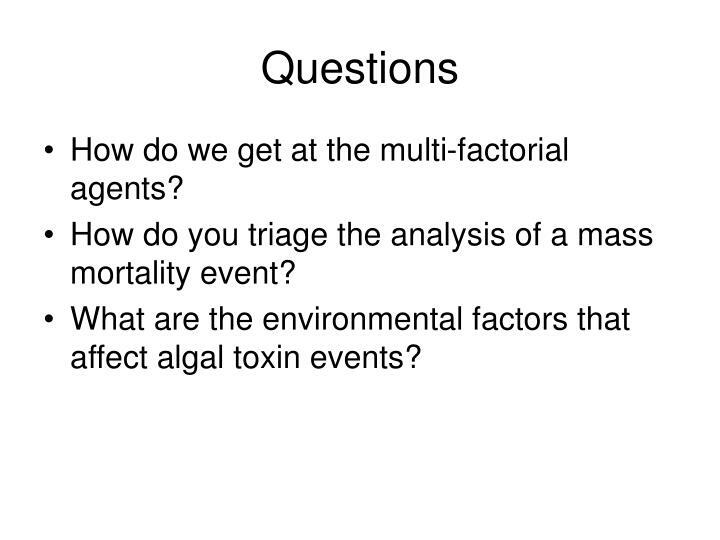 What are the environmental factors that affect algal toxin events? 1989. 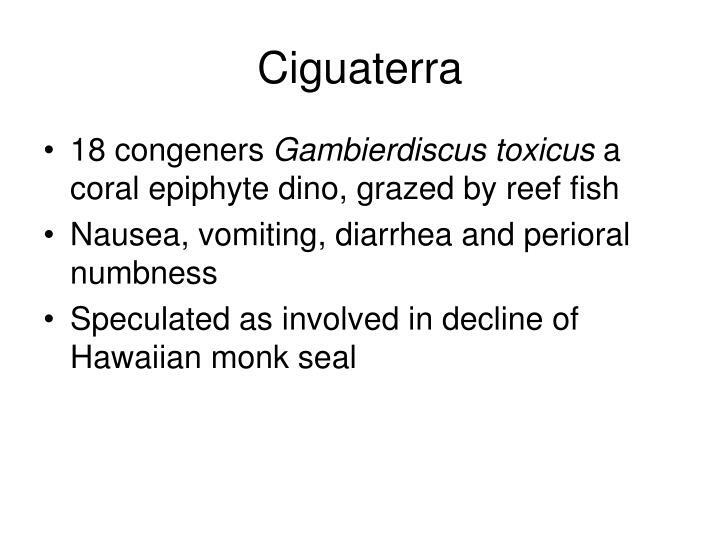 Toxic dinoflagellates and marine mammal mortalities. Report; Conference WHOI-89-36; CRC-89-6. Anderson, D. M., and A. W. White. 1992. 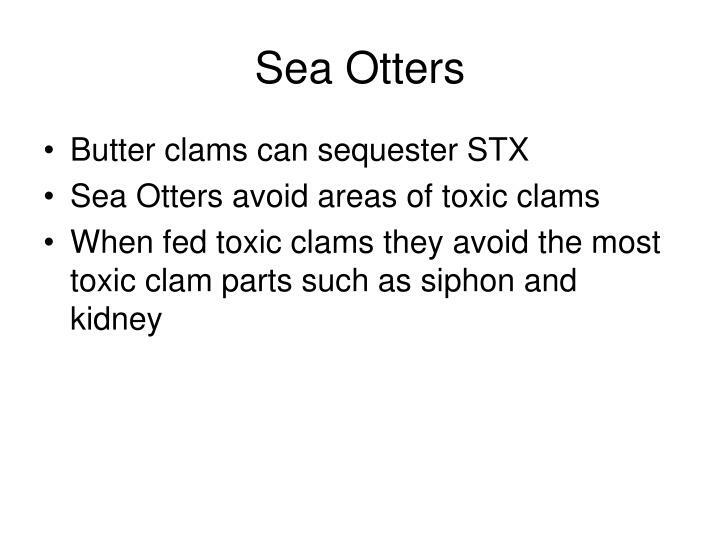 Marine biotoxins at the top of the food chain. Oceanus 35:55-61. 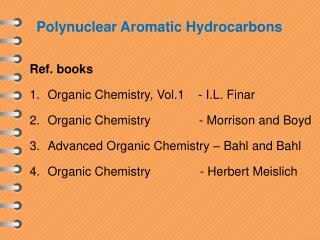 Lefebvre, K. A., S. Bargu, T. Kieckhefer, and M. W. Silver. 2002. 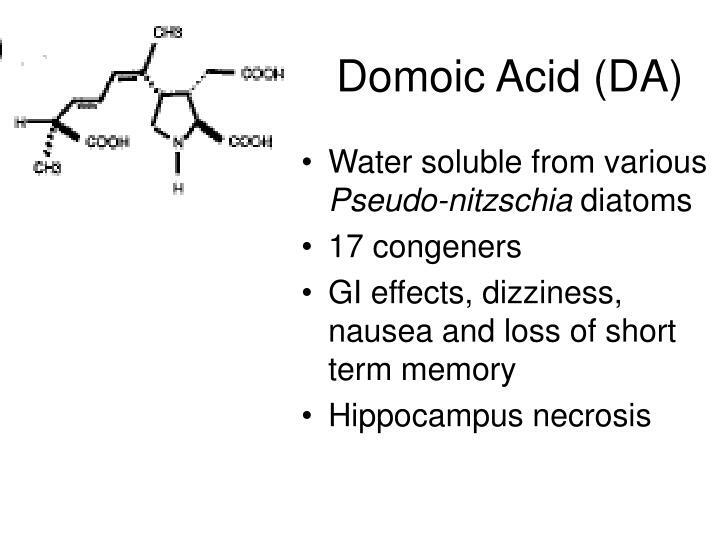 From sanddabs to blue whales: the pervasiveness of domoic acid. Toxicon [Toxicon] 40:971-977. O'Shea, T. J., G. B. Rathbun, R. K. Bonde, C. D. Buergelt, and D. K. Odell. 1991. An epizootic of Florida manatees associated with a dinoflagellate bloom. 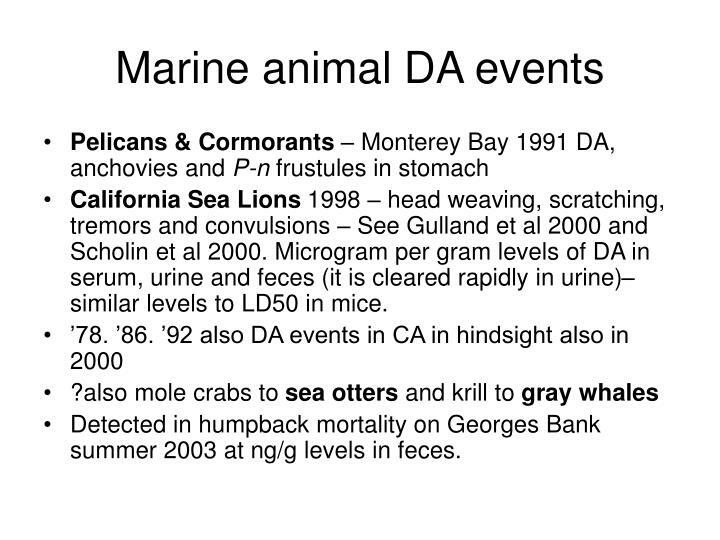 Marine Mammal Science 7:165-179. Rue, E., and K. Bruland. 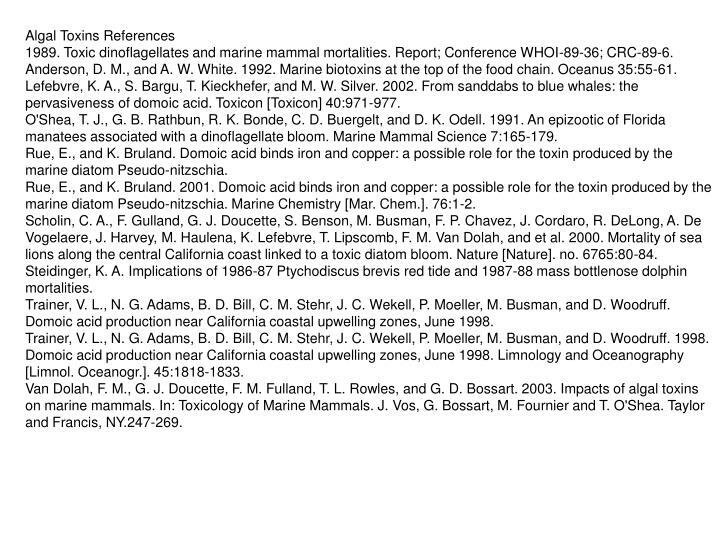 Domoic acid binds iron and copper: a possible role for the toxin produced by the marine diatom Pseudo-nitzschia. Rue, E., and K. Bruland. 2001. 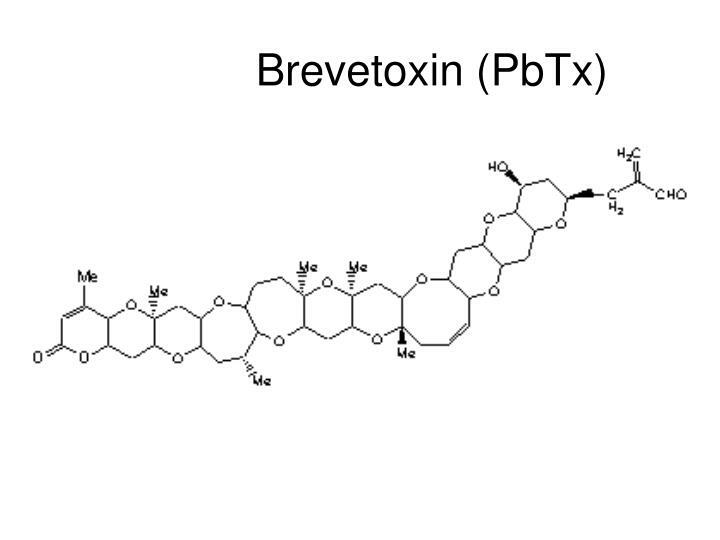 Domoic acid binds iron and copper: a possible role for the toxin produced by the marine diatom Pseudo-nitzschia. 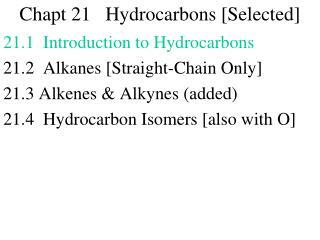 Marine Chemistry [Mar. 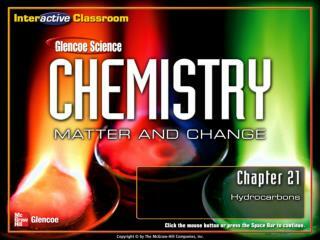 Chem.]. 76:1-2. Scholin, C. A., F. Gulland, G. J. Doucette, S. Benson, M. Busman, F. P. Chavez, J. Cordaro, R. DeLong, A. De Vogelaere, J. Harvey, M. Haulena, K. Lefebvre, T. Lipscomb, F. M. Van Dolah, and et al. 2000. 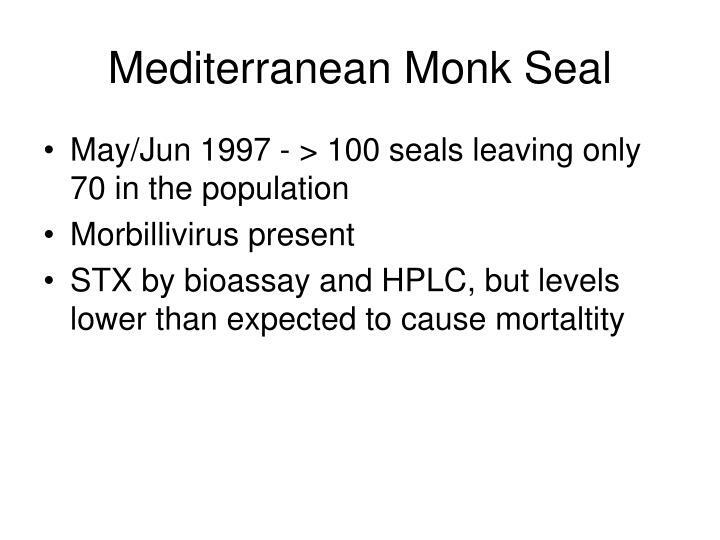 Mortality of sea lions along the central California coast linked to a toxic diatom bloom. Nature [Nature]. no. 6765:80-84. Steidinger, K. A. 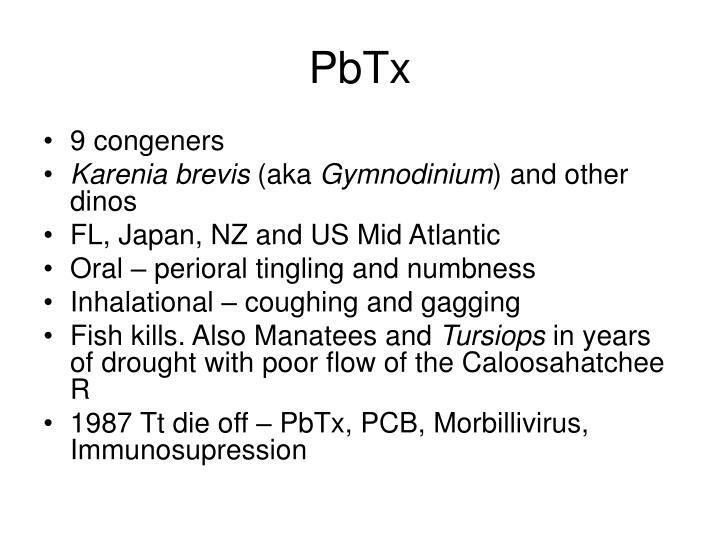 Implications of 1986-87 Ptychodiscus brevis red tide and 1987-88 mass bottlenose dolphin mortalities. Trainer, V. L., N. G. Adams, B. D. Bill, C. M. Stehr, J. C. Wekell, P. Moeller, M. Busman, and D. Woodruff. 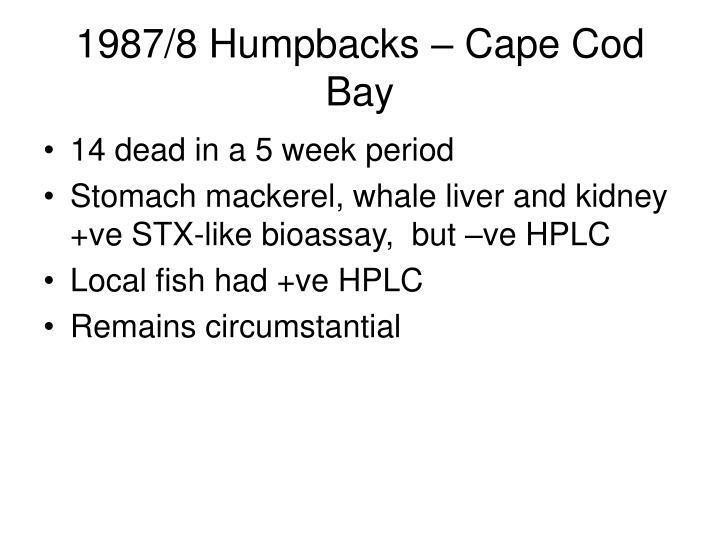 Domoic acid production near California coastal upwelling zones, June 1998. Trainer, V. L., N. G. Adams, B. D. Bill, C. M. Stehr, J. C. Wekell, P. Moeller, M. Busman, and D. Woodruff. 1998. Domoic acid production near California coastal upwelling zones, June 1998. 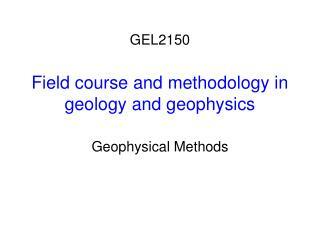 Limnology and Oceanography [Limnol. Oceanogr.]. 45:1818-1833. Van Dolah, F. M., G. J. Doucette, F. M. Fulland, T. L. Rowles, and G. D. Bossart. 2003. 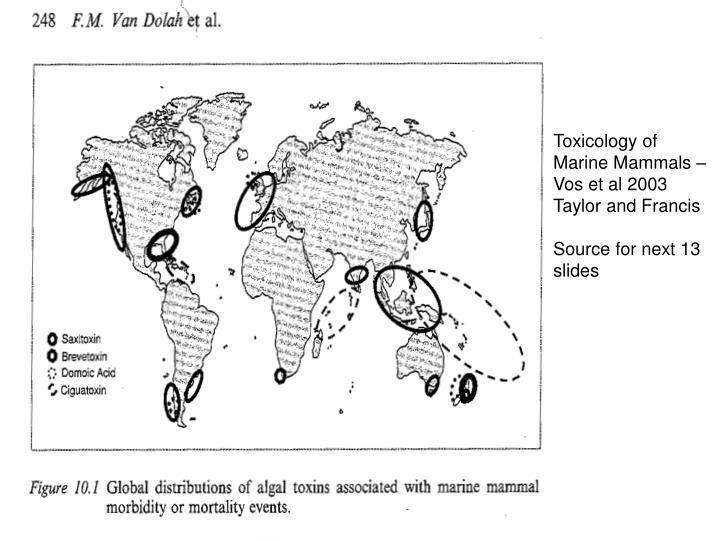 Impacts of algal toxins on marine mammals. 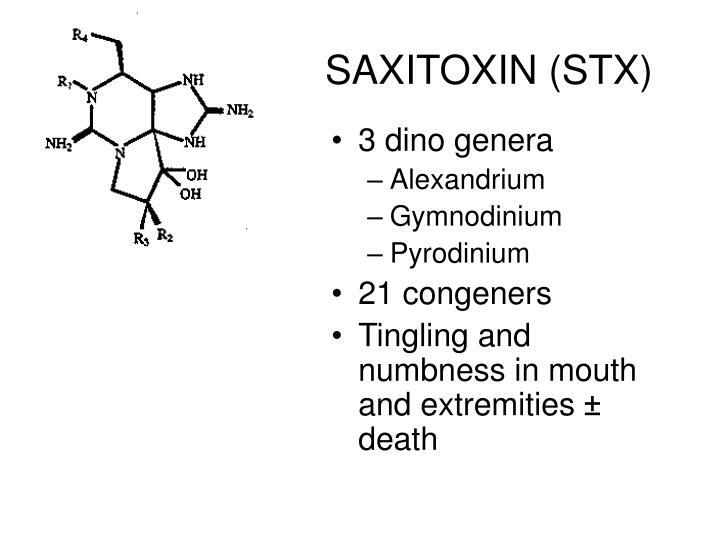 In: Toxicology of Marine Mammals. J. Vos, G. Bossart, M. Fournier and T. O'Shea. Taylor and Francis, NY.247-269. 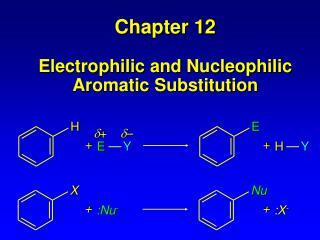 Chapter 12 (Part a) Reactions of Arenes : Electrophilic Aromatic Substitution -H. e. d +. d –. +. +. 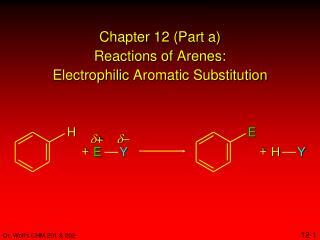 e. y. h. y. chapter 12 (part a) reactions of arenes : electrophilic aromatic substitution. 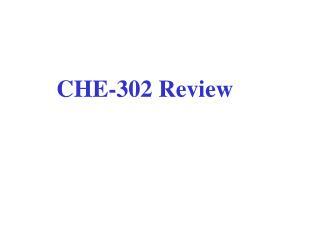 dr. wolf's chm 201 &amp; 202. 12-1. 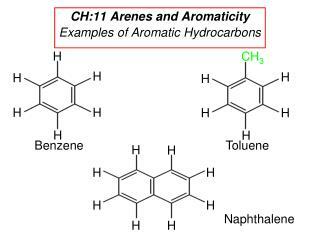 CH:11 Arenes and Aromaticity Examples of Aromatic Hydrocarbons -Ch 3. h. h. h. h. h. h. h. h. h. h. h. h. h. h. h. h. h. h. h. ch:11 arenes and aromaticity examples of aromatic hydrocarbons. 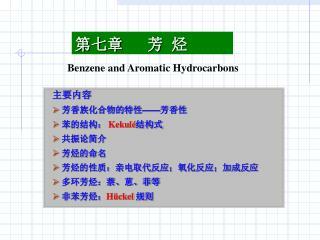 benzene. 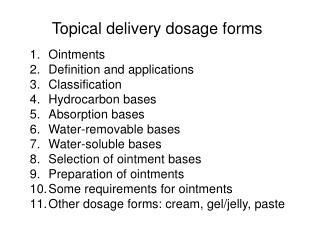 toluene. 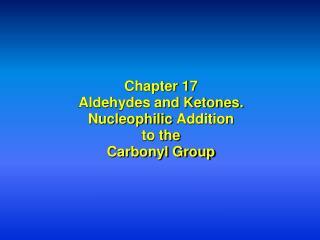 naphthalene. 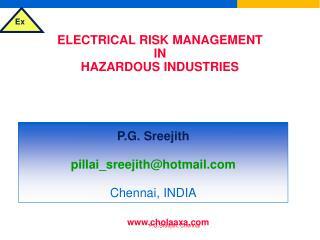 h.
ELECTRICAL RISK MANAGEMENT IN HAZARDOUS INDUSTRIES & SELECTION OF ELECTRICAL EQUIPMENT FOR FLAMMABLE ATMOSPHERES -Electrical risk management in hazardous industries &amp; selection of electrical equipment for flammable atmospheres. p.g. 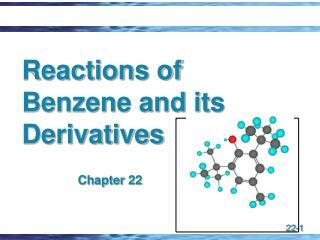 Reactions of Benzene and its Derivatives -. 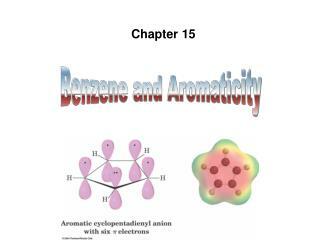 chapter 22. chapter 22. reactions of benzene. 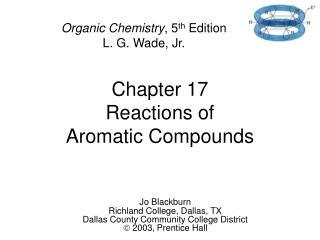 the most characteristic reaction of aromatic compounds is substitution at a ring carbon. 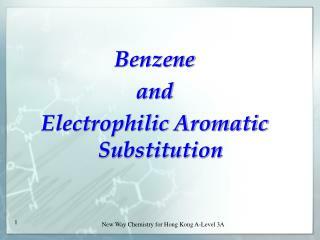 this is electrophilic aromatic substitution (eas) .